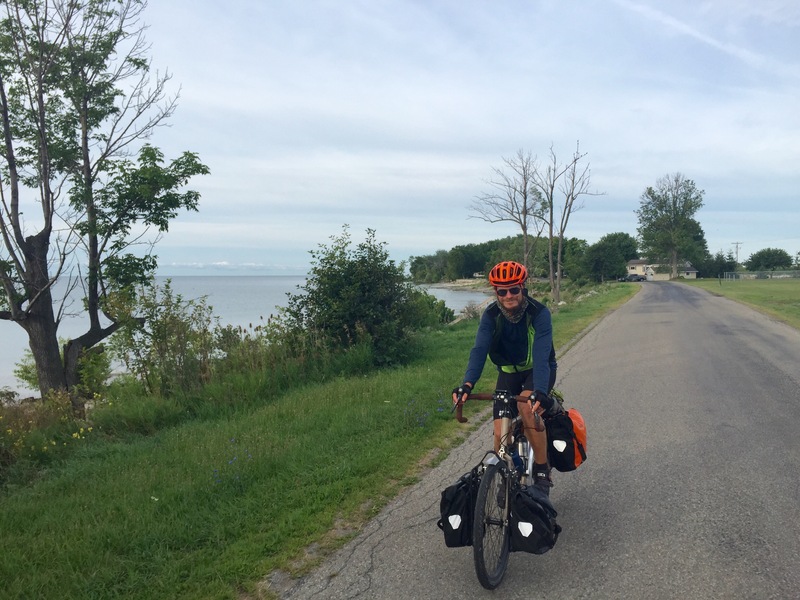 Day 54, 8/6, Peacock Point, ON, CA to Niagara-on-the-Lake, ON, CA: 81.8 miles, 625 ft elevation gain, 12.2 mph average speed. Trip Totals: 3,517.7 miles (74.8 mile daily average), 132,245 ft elevation gain, 12.5 mph overall average speed. Lost one rest day, 0 days behind schedule. Warning: I’m going to do a fair amount of gushing over how wonderful Canada is (with America being the implied point of contrast), so I’m sorry if that offends anyone. Today was perfect. The perfect day of riding. 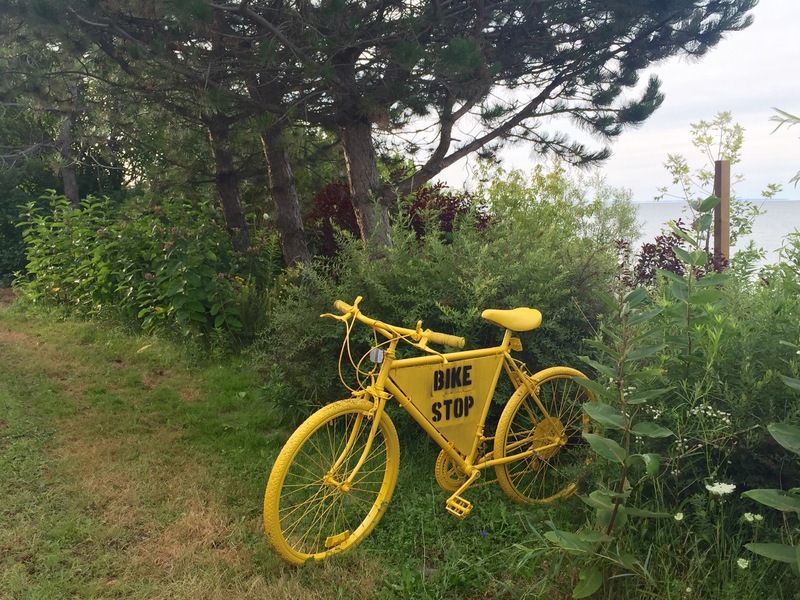 The perfect bike tour day. We didn’t pass anything spectacular today; it was just exceedingly pleasant for 100 percent of the day. We woke up pretty early today–even I woke up early!–because we knew we were riding our bikes to two rest days in a cute tourist town. 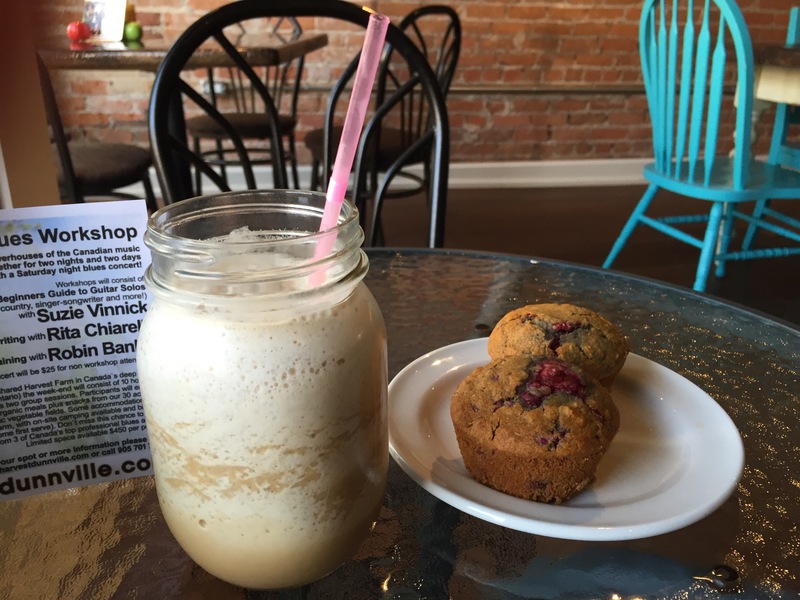 We rode hard over the last week in order to make today a bit shorter. Still 80 miles, but 20 miles makes a big difference at the end of the day. 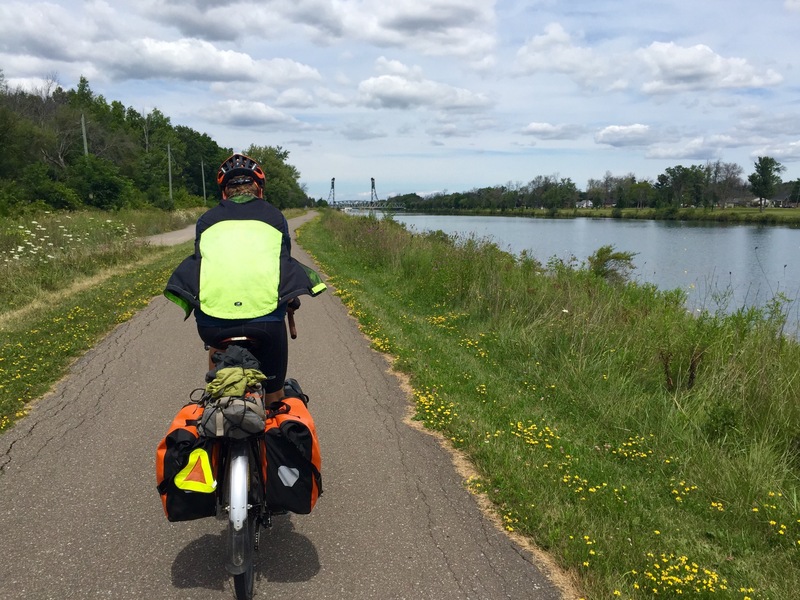 We rode away from the coast of Lake Erie for a few miles, then came to Lakeshore Road, which traced the shore for about half of the day. 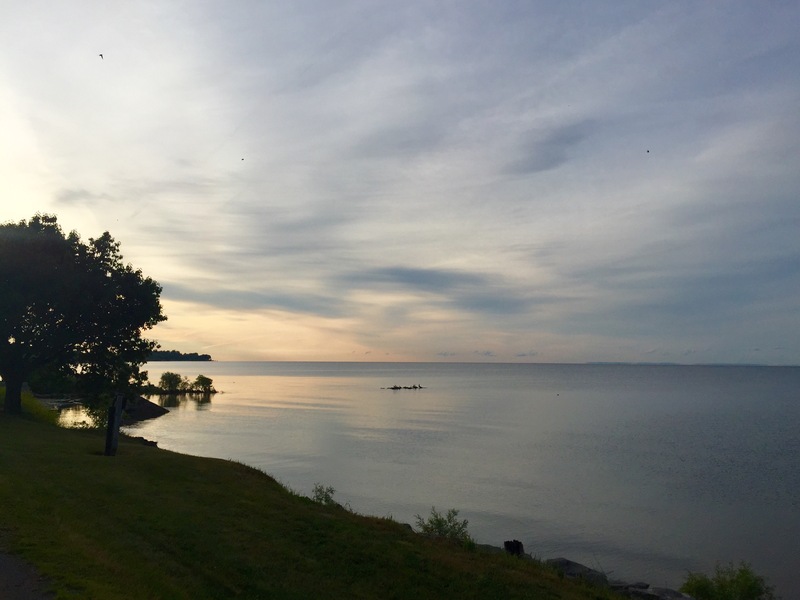 The Canadian side of Lake Erie is beautiful turquoise, albeit not as dramatically turquoise as Lakes Michigan or Huron, and Lakeshore Road delivered gorgeous views of the lake all morning. 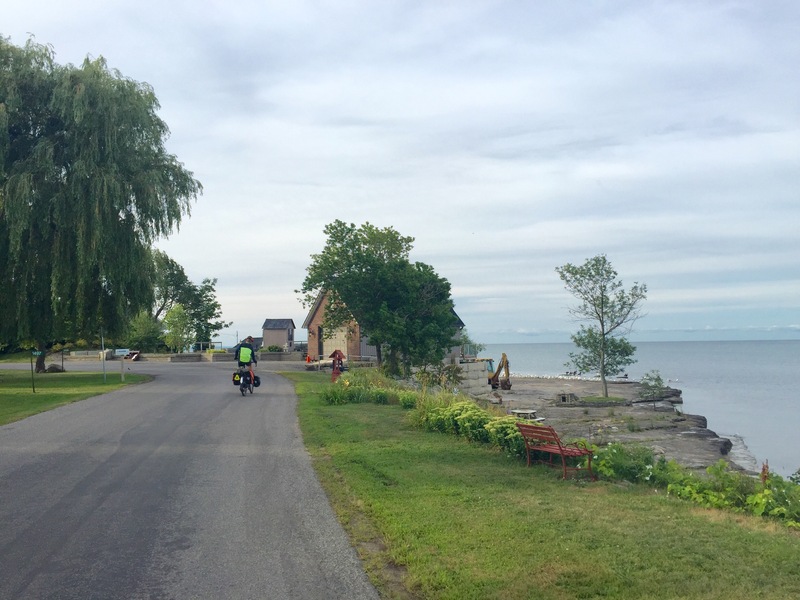 We’ve ridden past a lot of different types of lakefront properties, but the ones we saw today were by far my favorite. 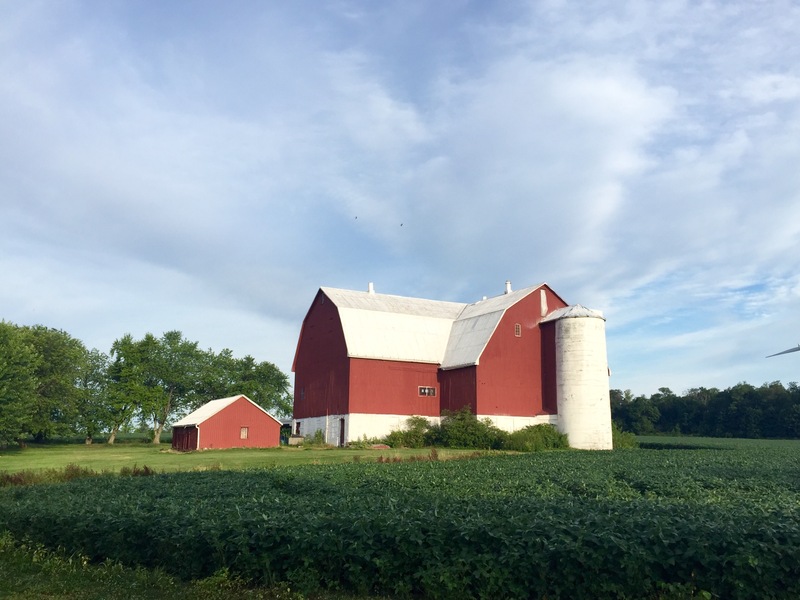 For the most part, the homes we passed today were smaller and a little more worn than others we’ve seen, but most had the mixture of character and practicality that I appreciate in a home (aka, no McMansions). The green house with the red door below is my favorite house of the trip. 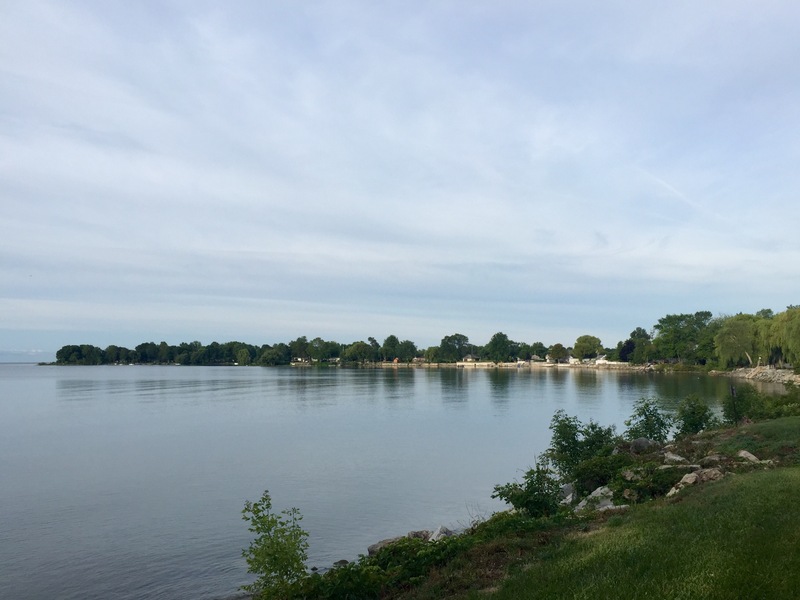 The lots were smaller and the beaches weren’t as nice, but the clusters of houses had more of a community feel than the larger homes on multiple acre lots we’ve seen. The prices were good, too! 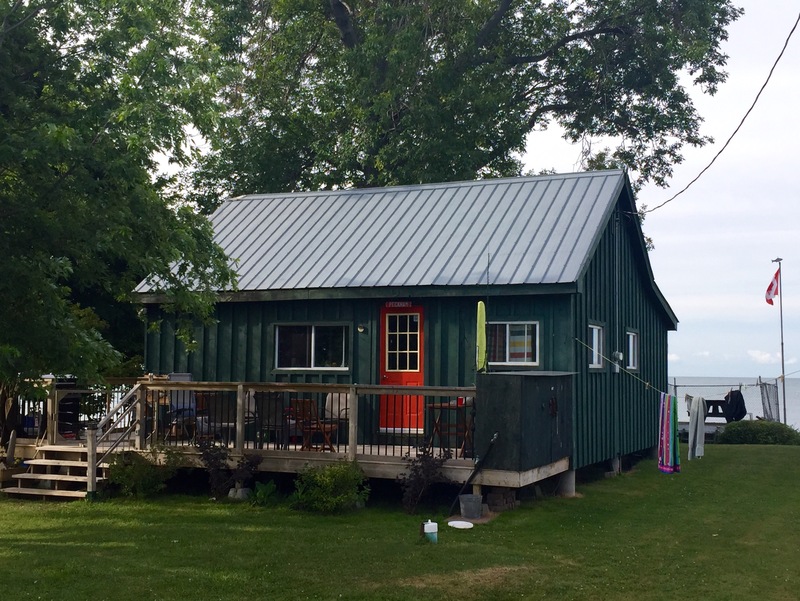 We saw lakefront homes for as little as 230,000 CAD, which wouldn’t even get you a studio apartment–or a parking space, for that matter–in our neighborhood in Brooklyn. It’s too bad Ted’s going to an American law school because I would have us moving to Canada tomorrow. 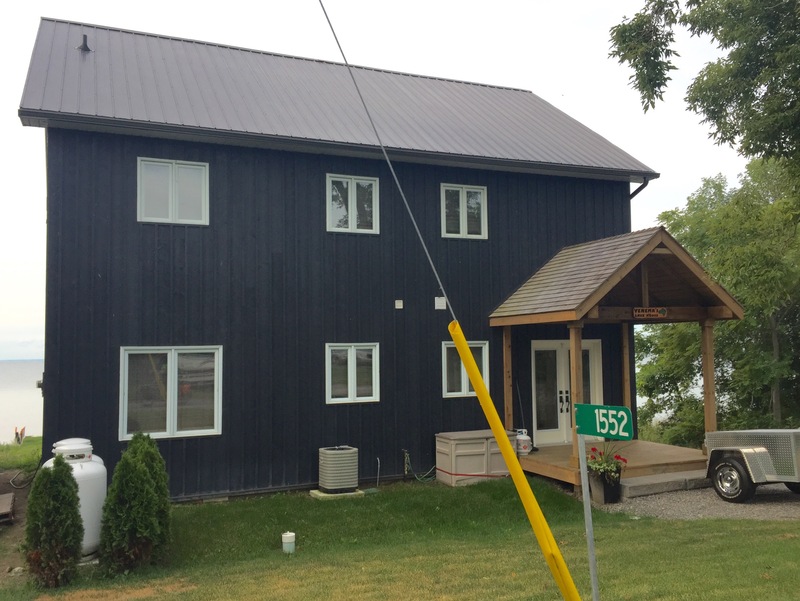 If anyone’s got 430,000 CAD (so only 340,000 USD!) lying around and feels like buying us a house, I’ve decided that I’d like this converted church, please. 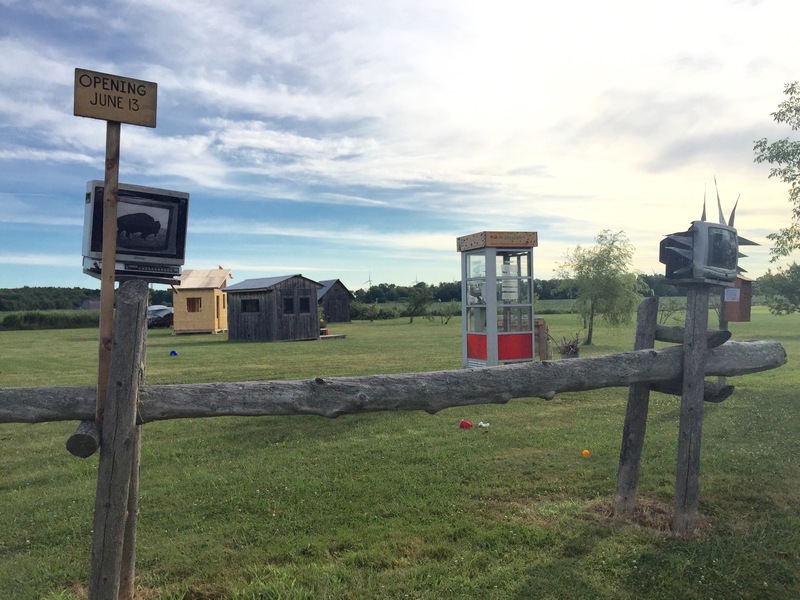 In the middle of this lovely morning, we passed a strange cluster of objects in the middle of a field – a telephone booth, a wooden beam with two TV tubes attached to the posts, and a large wooden chest. 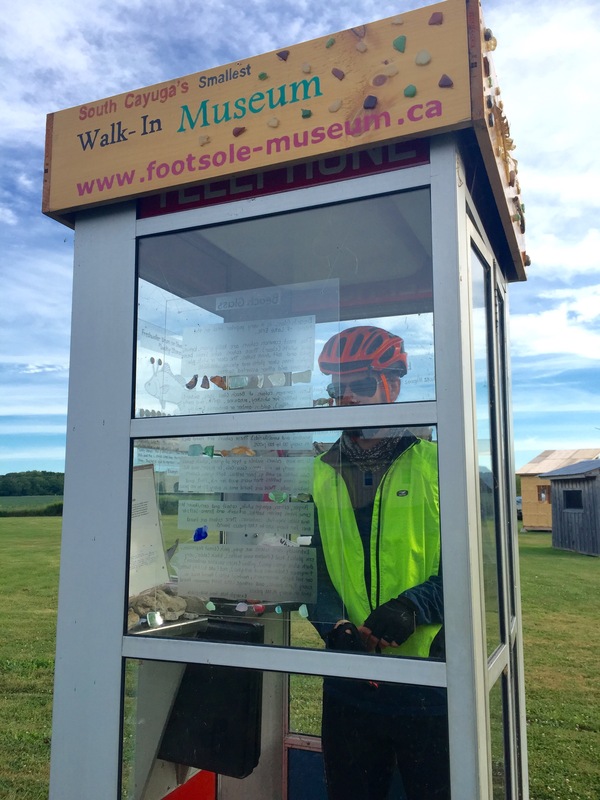 I slowed down to read the sign – it was a tiny museum! 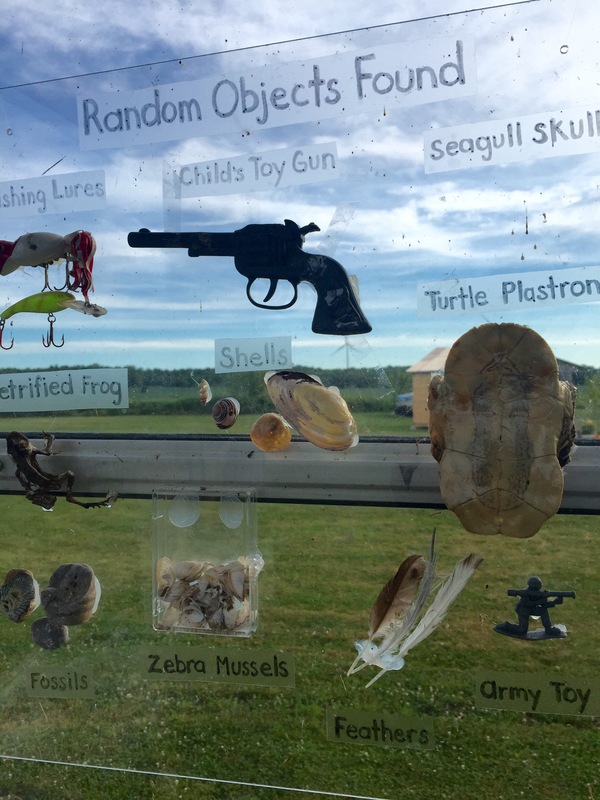 We stopped to explore, of course, and learned that the FOOTSOLE Museum is a collection of Found Objects On The Shores Of Lake Erie, created this summer by Ellen Irving, a woman who lives across the street from the museum. 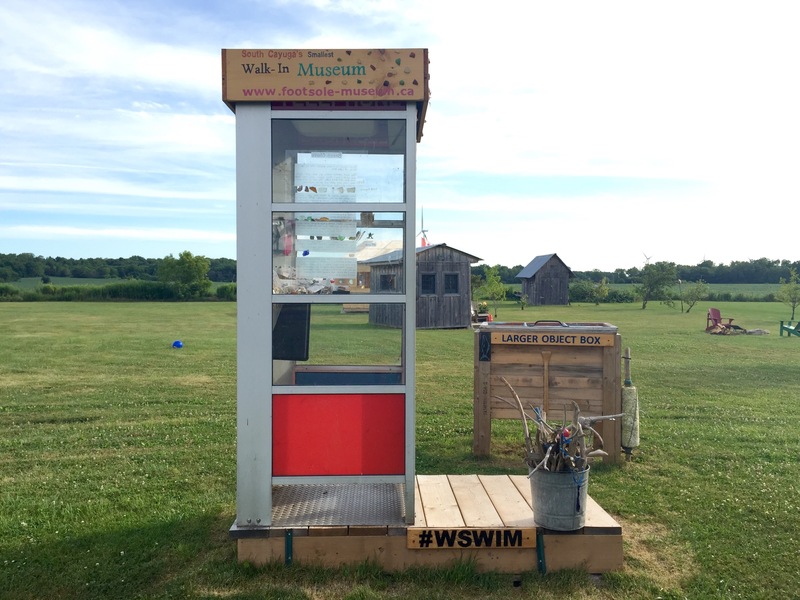 Irving set out to open South Cayuga’s smallest museum, and it surely must be a contender for the world’s smallest museum. 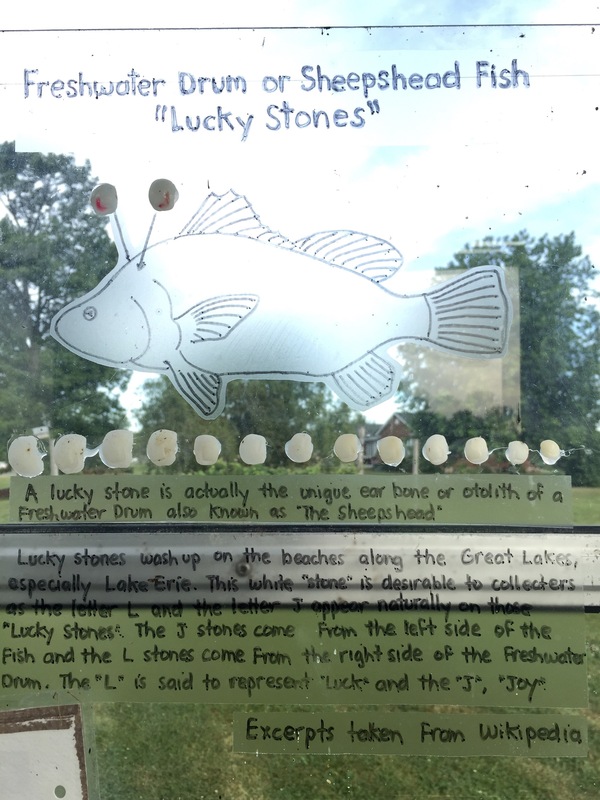 The phone booth is the main attraction, displaying on its walls beach glass (including rare colors and information about the different types), lucky stones, a petrified frog, some turn-of-the-century dentures, and a film canister with a message that floated down from Waterloo, Ontario over the course of 18 years! 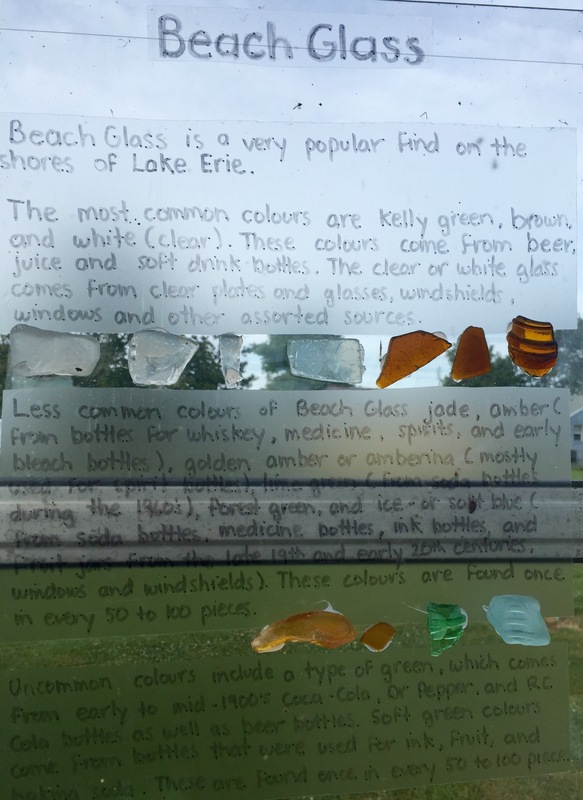 There are many other treasures inside, most with a hand-written description of the item, and visitors are encouraged to contribute to the collection. I feel like the word “whimsical” was created to describe this project. 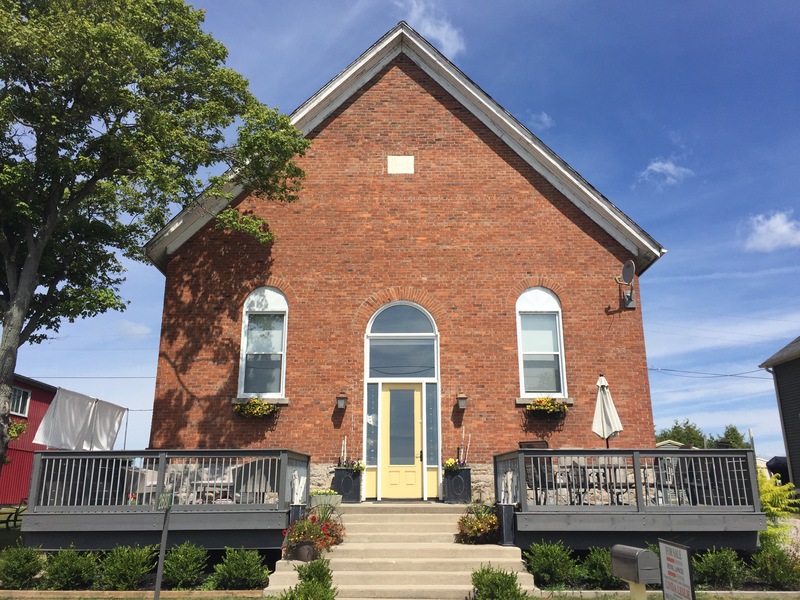 We kept riding along and turned away from the lake for a bit to get to Dunnville, where we continued our tradition of morning coffee and breakfast. 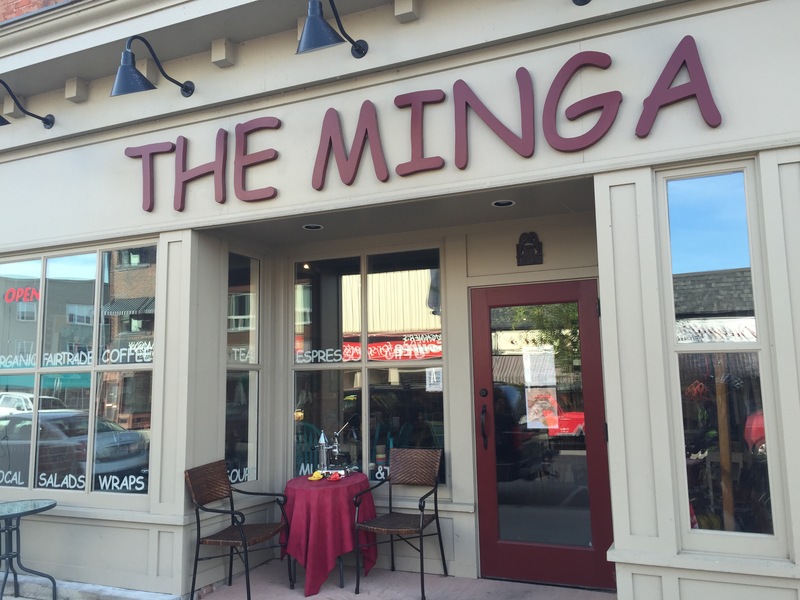 We spotted The Minga, a cafe that was created to build community in Dunnville and provide meeting space for any and everyone. 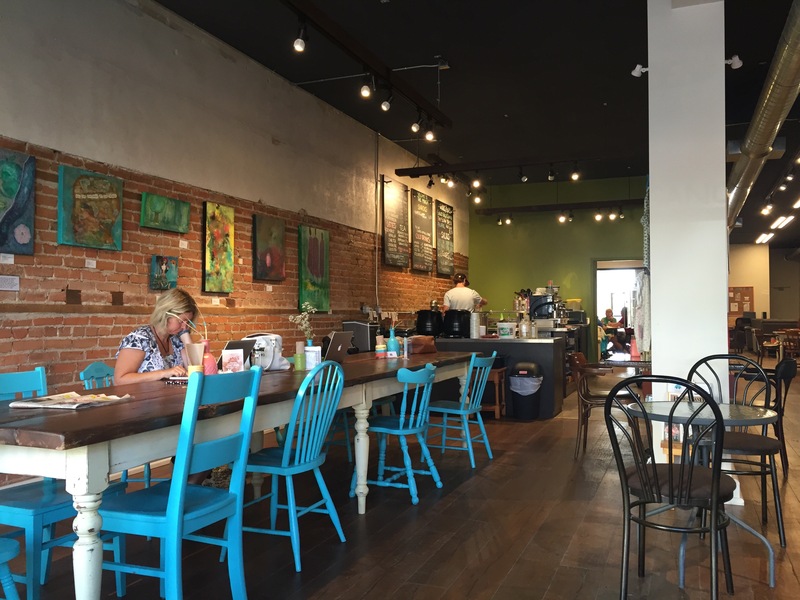 It was beautiful inside and we got coffee, dirty chai, hummus, and freshly baked muffins. We sat on their wifi for a long while (because even Verizon doesn’t work in Canada) before Ted dragged me away. We met back up with Lakeshore Road for more lovely riding before we reached Port Colbourne, where a couple miles of city driving brought us to the Welland Canal Trail, a trail that runs all the way from Lake Erie to Lake Ontario, and that would bring us to Ted’s parents’ vacation rental in Niagara-on-the-Lake (NOTL). 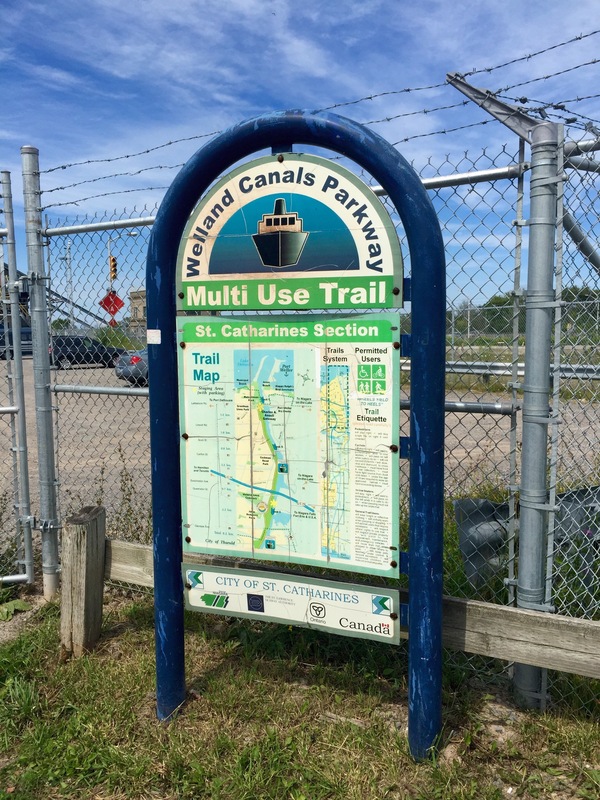 The Welland canal was beautiful, as was the trail. As I warned, everything was lovely, beautiful, perfect, etc. all day long. 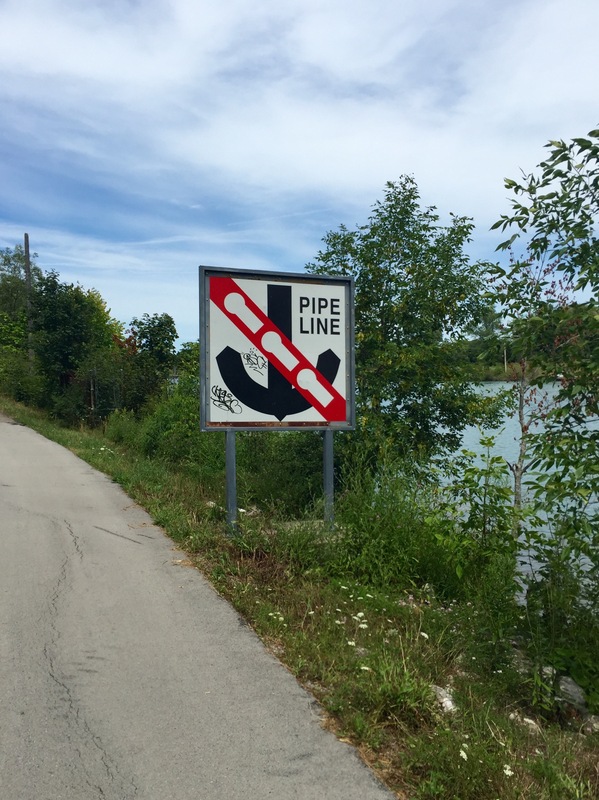 In Welland, we saw a sign for free air and Ted used the industrial air pump to pump up his tire. 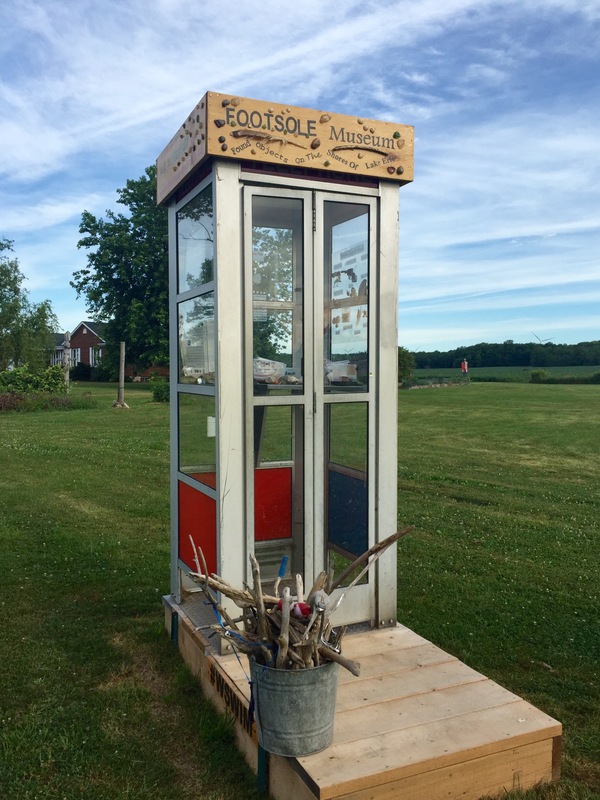 The dollar bill tire boot had reached the end of its useful life, and he just wanted to make it to NOTL before he had to change the tire. The pump was next to a community center that had a bathroom and shaded picnic tables, so it seemed like a good spot for lunch. 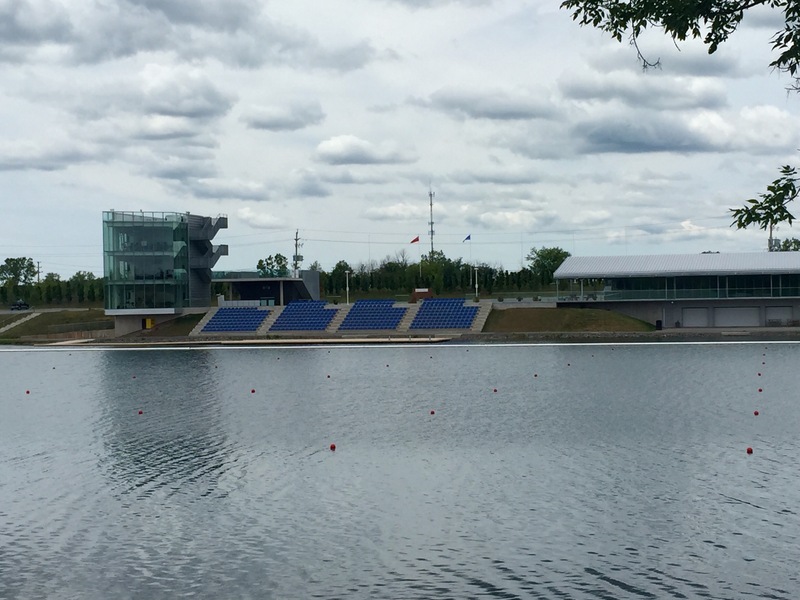 After eating tuna, we started off again and spotted this enormous grandstand on the canal. I’ve never seen such infrastructure to watch a regatta! 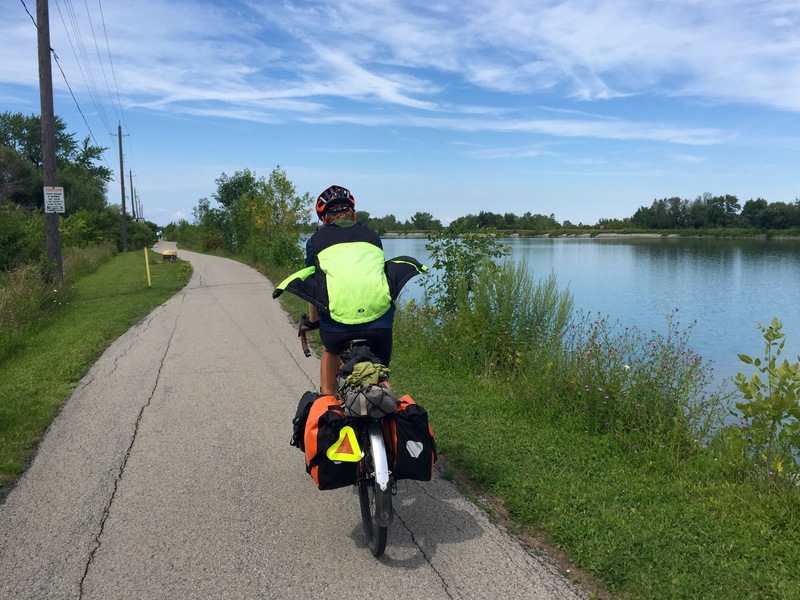 We met a retired man on a road bike who was very curious about bike touring. He attributes the disappearance of his back problems to bike riding and wants to try out touring. 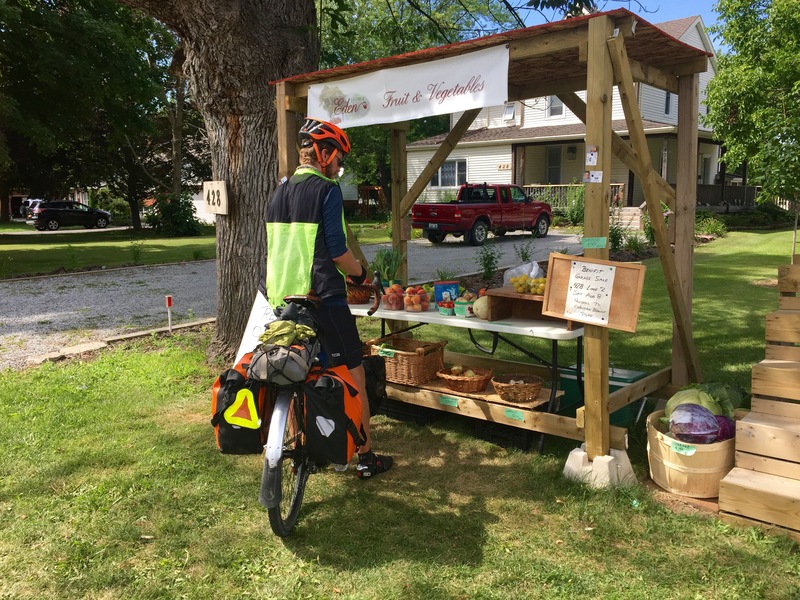 He was a really nice guy and he told us not to pass up the fruit stands we’d see as we approached NOTL. 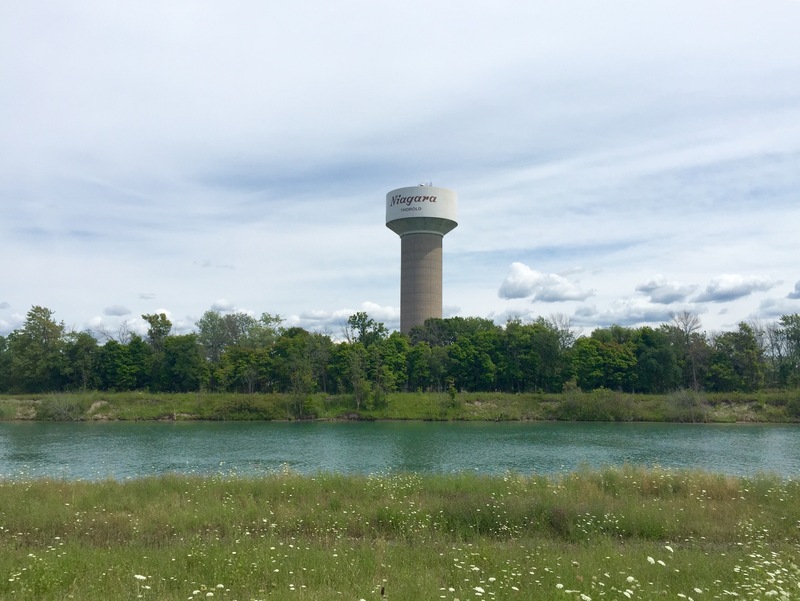 We passed the town of Thorbold, which had a tremendous mural project on the buildings next to the canal (sorry, I wasn’t quick enough with my camera, but here are some pictures), then left the trail shortly thereafter to ride toward Ted’s family’s house. 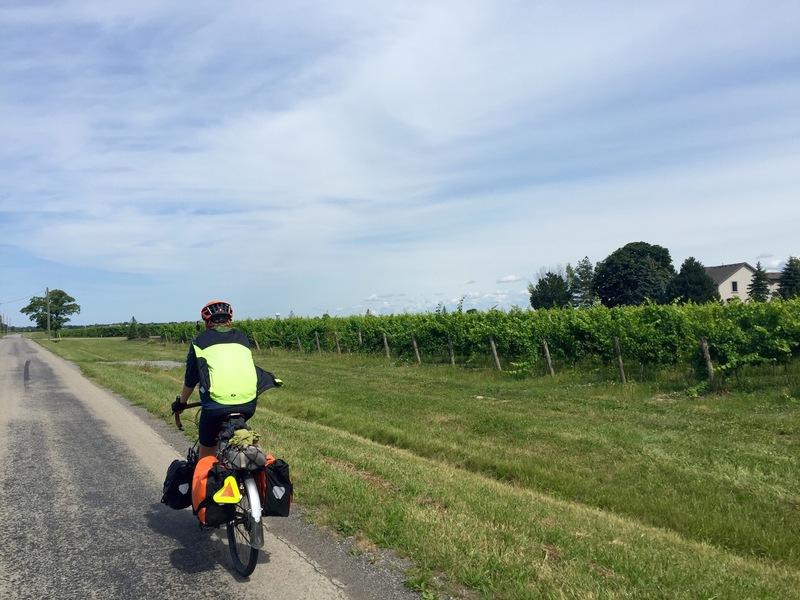 We rode through acres upon acres of vineyards and stone fruit orchards, which is a welcome agricultural change from corn, soybeans, and wheat. We picked up a load of peaches for just $2 and while some weren’t quite ripe yet, the ones that were lived up to the hype! After a few miles of town riding, we reached The Cabernet House, our home for the next three nights! Ted’s sisters were outside watching for our arrival, which was a super fun way to end the day. We sat on the porch for a while, then showered and ate Ted’s dad’s famous spaghetti. Ted requests his dad’s spaghetti every time we visit his parents in Pittsburgh, and it never disappoints! I think Ted ate a full pound of spaghetti by himself. Maybe more. 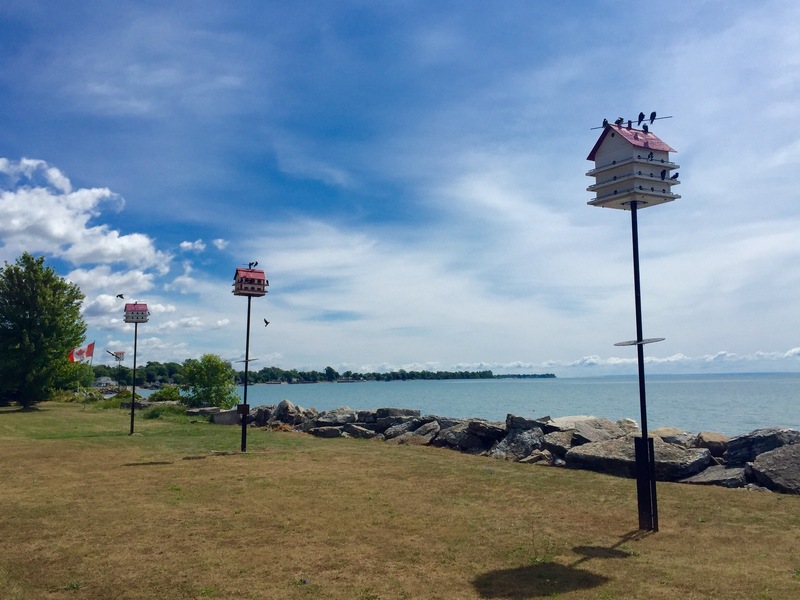 We then all headed down to Main Street to get ice cream, then headed to take our first look at Lake Ontario. We could see Toronto in the distance, which was pretty cool. After this trip, I’ve got my eye on Toronto as a potential home after we get priced out of NYC (though, Toronto isn’t a whole lot cheaper). We were pooped so we went to bed pretty soon after we returned home. We’re getting pretty close to the end of our trip and are getting reflective already. 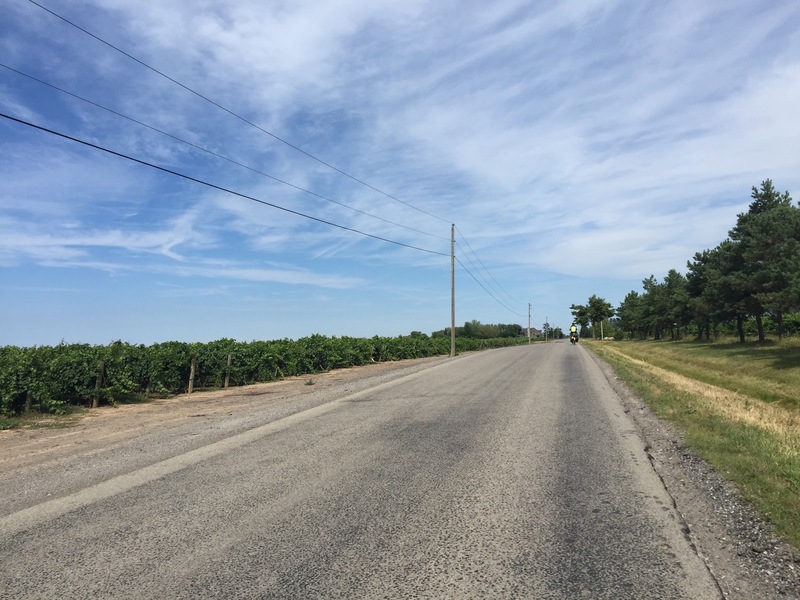 We rode our first century last fall–the New York City Century, which is flat and well-supported–and if you told me after that ride that I’d ride 100 miles with 50 pounds of gear on my bike, I would have laughed at you. If you told me I’d do that for six consecutive days, I would have had a panic attack. It’s amazing what your body is capable of if you manage to persuade yourself that something is possible (or, more accurately, that it’s necessary). I can’t believe we’ve come so far and I’m equally surprised that we’ve had fun doing it. I hope we make it home safe! I agree with you about Canada. Love, love, love it! Your entire journey has been so amazing. Thanks for sharing. Isn’t it wonderful? 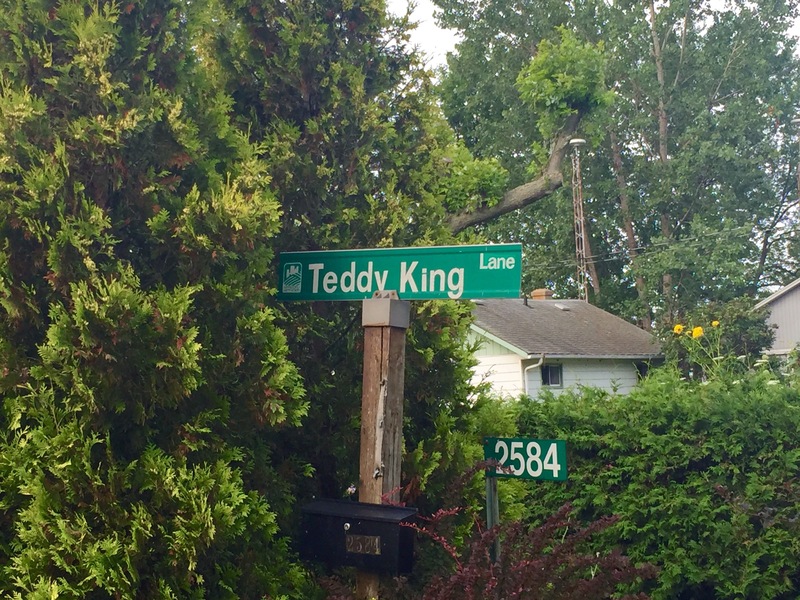 I’m very tempted to move!